I had so much fun making my last gift bag, that I decided to continue working with the latest sketch from Mojo Monday. I also stopped by the Merry Monday Christmas Challenge site. Because let's face it, I'm working on Christmas crafts, so why not let them help inspire me to create something beautiful! 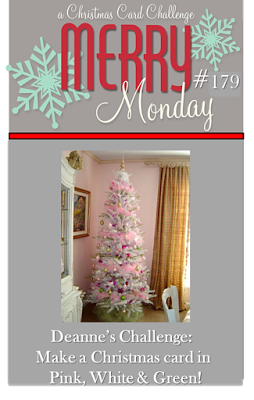 The folks over @ Merry Monday Christmas Challenge, have a inspiration photo, and a color challenge: pink, green, and white. I can do that! I rotated the sketch. I also changed the circle element for another square element. I used ribbon and trim for the long banner piece. I did add a floral element but I tied on an ice skate! I used a holiday image and sentiment. Both of which are heat embossed with early espresso embossing powder, on shimmer white card stock. For the 'panels' I matted each of the pattern papers with kraft card stock. I also added some machine stitching to these pieces. I think this adds a homespun look and feel. 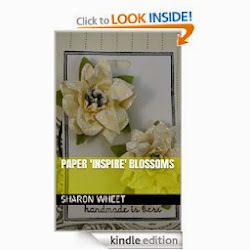 I used Happiness is Homemade pattern paper from Tilda. The large pink blossom is a Melissa Frances item. I used a light champagne shimmer textured card stock for the base of the bag. Thank you for looking. I hope you have been inspired. 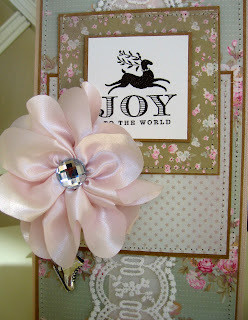 Now, I'm headed back into my craft room, to finish some jar toppers, desk top calendars, and some magnetic monograms. Oh, and my trophy cups, and some altered salt shakers. Whew, sounds like a lot, but once I get started, it moves along quickly. 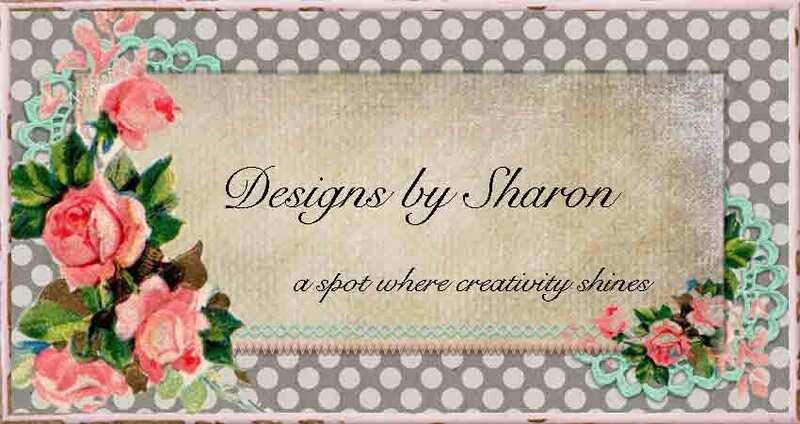 Sharon, I love the soft, vintage feel of your oh-so-pretty creation!! Thanks so much for playing with us at Merry Monday! This is beautiful!! This is the perfect color combo to do something vintage-y! Love it! Totally delightful! Love all your design elements. Thanks for sharing at Merry Monday. Love what you did with this sketch! Such a beautiful creation!